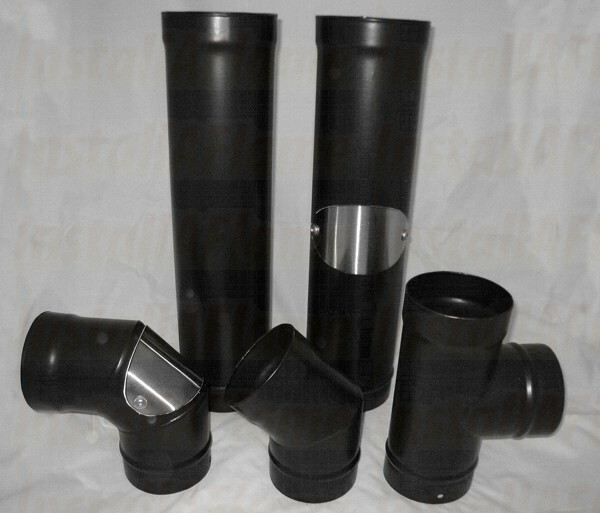 This Stove pipe is available in 100mm (4"), 125mm (5"), 150mm (6"), 180mm (7") and 200mm (8") diameters. Matt black and gloss black are available in all sizes. Matt Black, Sunset, Sky Blue, Green illusion, Gold, Rich Metallic Brown, Shimmering Rose, Honeyglow Brown, Mojave Red, Surf Sand, Mauve, Blue Metallic. Vitreous enamel is a single wall prefabricated stove pipe, manufactured and coated to the highest standards, made from 1.2mm thick superior grade zero carbon steel. Following manufactures components are coated both internally and externally with a ground coat and top coat of high temperature resistant and acid resistant vitreous enamel coating. Due to the chemical specification of the steel used for this product, it provides an excellent surface for the glass coating to adhere to. Lengths and fittings have a quick and easy to use socket and spigot jointing system which is leak proof when sealed and installed as recommended. Stove pipe is designed as a connecting flue pipe with high temperature and acid resistant vitreous enamel coating. It is suitable for use on gas, oil and multi fuel appliances, rating of up to 50kW output, where appliances burn with flue gas temperatures of up to 450∞C under continuous firing and is soot fire resistant. Stove pipe should only be used to connect from the appliance into an existing lined chimney, or class 1 twin wall insulated stainless steel chimney.